A. Open Inno Script Studio (from Start menu of by doubleclicking on it's icon located on your desktop). B. In main menu in Tools submenu you can see a new item – Graphical Installer. Click it and you see six sub-items. 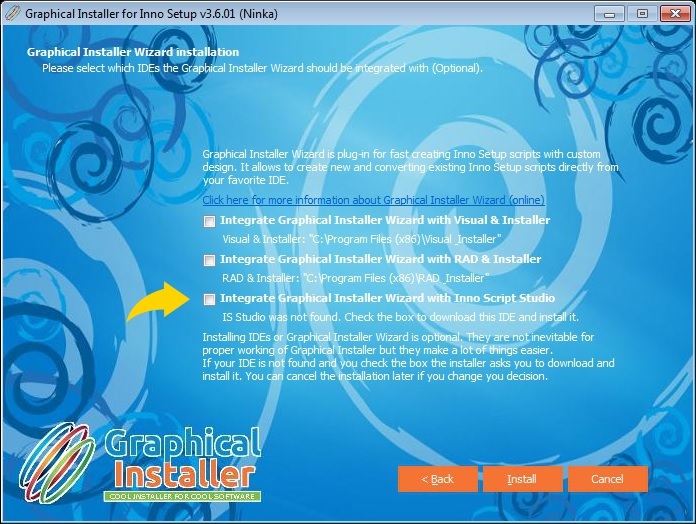 If you can see this menu then Graphical Installer Wizard was installed correctly and you can go to step 3 Configure and then Launch the Graphical Installer Wizard. 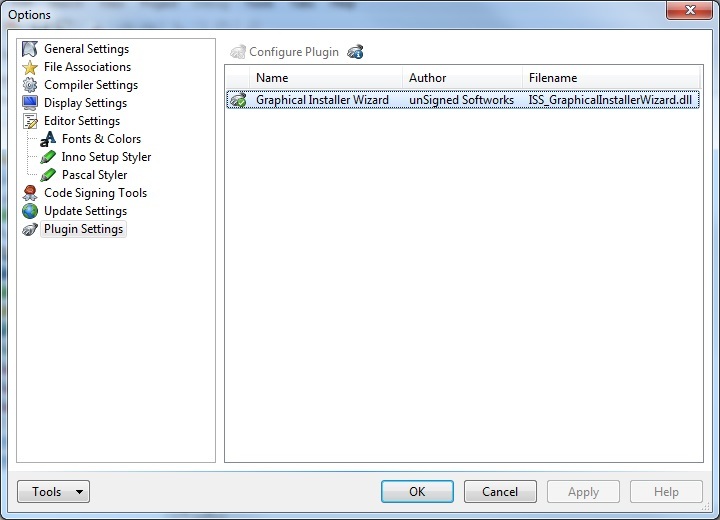 If you cannot see the Graphical Installer Wizard menu from picture above then please check your Inno Script Studio installation directory (Inno Script Studio\Plugins) for presence of file ISS_GraphicalInstallerWizard.dll. Plug-in is being copied here during the setup process of Graphical Installer. Make a sure you checked it during installation of Graphical Installer. If everything went correctly then you can see this file in Inno Script Studio Options dialog: Launch Inno Script Studio and click Tools -> Options to show this dialog, then click Plugins in left tree. 1. Open Inno Script Studio if you have closed it. 3. Click Configure item (or press Ctrl+Alt+F11). If you had Inno Script Studio already installed, everything is set automatically during the setup process, so all you need is to check whether paths are correct.